You are here: Home / Game Recaps / 2010 Game Recaps / Lions manhandled by Riders in return to Empire. Lions manhandled by Riders in return to Empire. It was the first regular season CFL game played outdoors in Vancouver since Nov. 6, 1982, and while the atmosphere for the return to Empire Stadium was outstanding, the Lions themselves showed they have a lot of work to do if they hope to contend with the big boys on the CFL’s west division. BC had no answers for Saskatchewan’s defence who pressured the Lions quarterbacks at will, exposing an inexperienced offensive line that is going to have to get better if Casey Printers, Travis Lulay and Jarious Jackson want to finish this season on the active roster and not the injured list. Printers left the game just before the half as a result of a bruised or strained quad muscle trying to evade the pressure of Riders rookie Brent Hawkins. The constant pressure rendered the Lions offense useless, with quarterbacks and receivers having no time to make reads or run their routes. The running game had flashes os success, but was otherwise ineffective with JamallRobertson netting just 54 yards on 10 carries. Withthe Riders offensive line firing on all cylinders, Durant was able to findreceivers seemingly at will on second down, and the green machine churned out 188 yards along the ground, 93 of them going to Wes Cates. When the Lions weren’t allowing pressure, they were taking penalties. 16 all together on the night for 116 yards. Withthe Lions defence on the field so much, they were worn down in the second half, and the Riders had no problem putting together drives to close out the game. 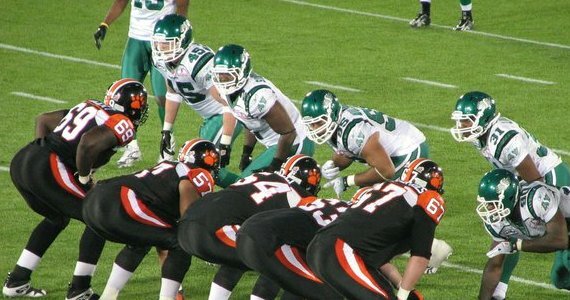 Their defence sealed the deal with another blindside hit on Lulay who fumbled, giving the Riders an easy touchdown. Slotback Geroy Simon was one of the lone bright spots for the Leos, scoring both Lions touchdowns on a 32-yard pass from Printers in the first quarter, then gave the faithful something to cheer for connecting with Lulay on a 92-yard play when the game was already decided. Paul McCallum hit on a 16-yard field goal and added a 45-yard single, while also coming up short on a fake punt that exposed the kicker’s lack of blinding speed. The Lions had few wrinkles in their offense to throw at the Riders, prompting Dean Valli to say in a Lowell Ullrich piece that “They know what we’re going to do.” That’s not a ringing endorsement of the offensive game plan that at this time of year, should have had the Riders guessing. The talents of Jamal Lee and Andrew Harris are sparingly used, and if these players are going to have an impact, the Lions have to give them chances to do so. Once again the team had trouble stopping the run. Possibly a product of being worn out in the second half, but on the last couple Rider drives of the game, they ran the ball down the Lions throats. Things won’t get any easier for the Lions as they next take the field on Friday, July 16th at 7:00pm versus the Grey Cup Champion Montreal Alouettes. The game was a sellout, at 27,528 fans…The Lions Brent Johnson played in his 152nd consecutive game…The atmosphere at Empire Field was fantastic, the tailgate parties were outstanding and had little to no issues, but inside some work needs to be done to address the concession lines. Reports of 30 to 45 minutes in the beer lineups had fans thirsty and cranky, and there were no options for refreshments in the stands. Fans on the west side of the stadium who were baking in the sun in the first half had few options but to brave the lineups and miss large chunks of the game if they wanted anything. All part of the learning process that comes from a temporary facility, and hopefully all involved can work out some of the kinks in time for Friday.